Disney Comics Worldwide: How long have you been a comic book artist and how did you get started working for Disney Italia? Casty: Well, I was born in 1967 and started making comics in 1977. 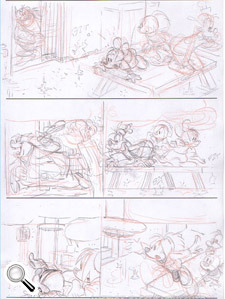 No, I’m not kidding, listen … I wrote (and drew) my first Disney stories when I was ten years old, on my school books. Then I handed them out to my fellow students. 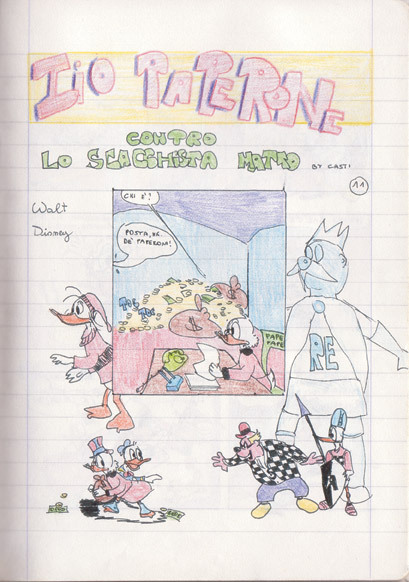 My friends were enthusiastic; every week they were waiting for a brand new story, just like it was a real weekly Mickey Mouse magazine (“Topolino” in Italy). 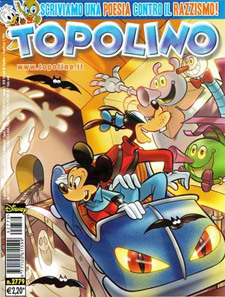 They didn’t know (and neither did I) that the stories in the “real” Topolino were made by many different authors (and not all written by Walt Disney himself). 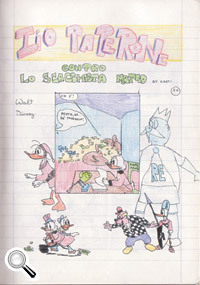 Professionally, I started writing comics in 1993 for “Cattivik”, a monthly comic book for kids, which is very popular in Italy. My first story was published in 1994 and, so far, I have written (and sometimes drawn) about 200 stories for Cattivik. 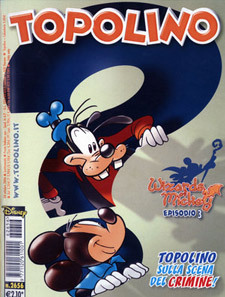 In 1999, I started writing for another famous Italian character, “Lupo Alberto”, and in September 2002 I finally started working for Disney Italia. When I came to Disney, I found my new colleagues were not very enthusiastic about writing Mickey Mouse stories and almost all of them preferred writing Duck stories. Well, I thought that was a pity; for me, Mickey was so lovable! I had in my mind those wonderful stories by Romano Scarpa and Floyd Gottfredson. To me, that was the “real” Mickey; always ready to get into adventures, with that sort of naive sense of wonder that was actually lost, in recent years, when he was turned in that sort of know-it-all detective. 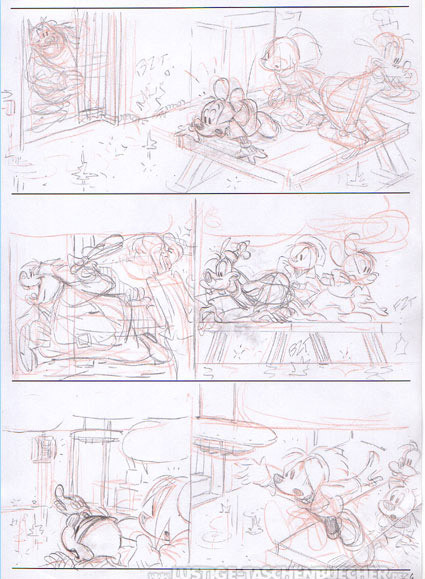 With Giorgio Cavazzano, Massimo De Vita and many other Italian artists, we inspired a new interest in Mickey Mouse stories; working with Mickey became stimulating again. And, most importantly, readers showed their appreciation for these new stories with Mickey! Nowadays, many other writers take care of Mickey, so I finally have the chance to rest as a writer and dedicate myself to drawing. 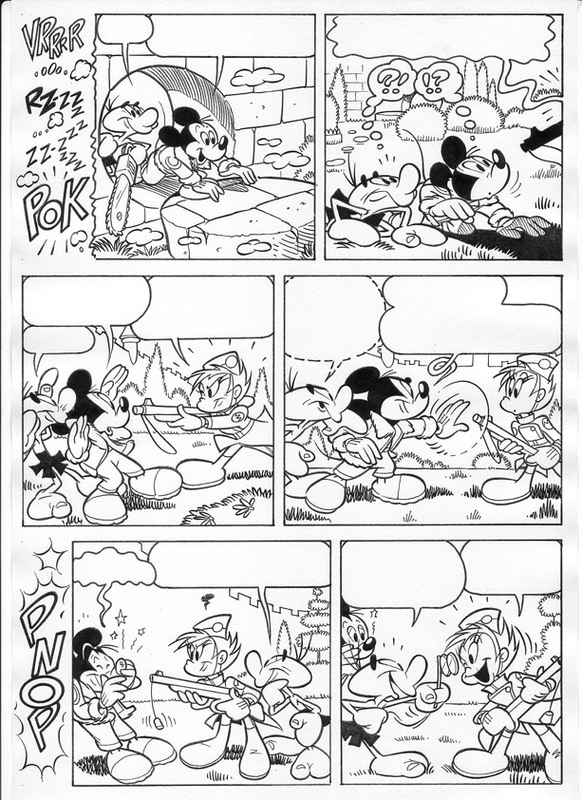 DCW: Your long adventure stories with Mickey Mouse have a classic feel to them, reminiscent of the work done by great artists like Romano Scarpa and Floyd Gottfredson. Did they influence you and what other artists do you admire? Casty: I’m really honored (and embarrassed) when people compare my work to Scarpa’s and Gottfredson’s. 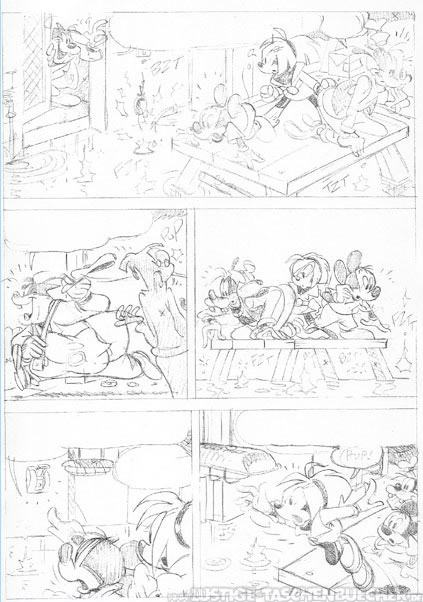 I think Scarpa, Gottfredson and – of course – Carl Barks are a trio of incomparable Grandmasters; they are on the Mount Olympus of the Disney comics world. When you decide to use a character that’s not yours, you absolutely have to respect the character's history. 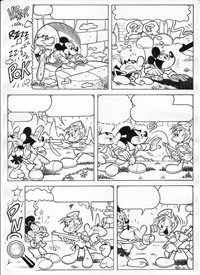 When Scarpa started in the 1950s, he scrupulously followed the style of Gottfredson’s Mickey, because he loved him and respected him. So, it’s natural, for me, to follow Scarpa’s style, because his was the REAL Mickey. By "style" I mean both drawing and writing. Okay, you can add something of your own or you can explore new sides of his personality, but the character must remain the same. It’s up to you to find and write good new stories for him! Here in Italy, the stories I wrote trying to restore Mickey’s old spirit have been very much appreciated by readers and critics alike. I even won a national prize as best writer in 2006 (Fumo di China) and I often receive fan mail from readers and fans from around the world. By the way, every now and then someone pops up saying “Bah, your stories are too vintage for the 2000s â€¦” Well, what does that mean? A good story is a good story, period. Every year we see Hollywood remaking old movies, which means that the original story was good. My purpose is to capture the Disney character's “spirit” (and not only from Scarpa, but from Gottfredson, Walsh, Barks and even (Rodolfo) Cimino and (Giorgio) Pezzin, two great Italian authors), and try to make new GOOD stories. DCW: You’re popular in Europe and have proven to be a great writer and artist. What do you think are the ingredients for a good story? DCW: How do you come up with your stories? Where do you get your inspiration? Casty: When I was young I read hundreds of books. Verne, Salgari, H.G. Wells and Asimov were my favorites. And, I liked a lot of those science fiction movies like “Invasion of the Body Snatchers” and “Forbidden Planet.” I always liked mystery and adventure, and that’s why I try to put these elements in every story I write. By the way, I’m charmed by modernity, as well: computers, virtual reality, technological discoveries are a source of inspiration for many of my stories. DCW: Which do you prefer, to write or draw stories? And which do you find more difficult? Casty: Writing is like giving away a part of yourself. Things you had inside are given away, forever. This makes you happy but, at the same time, you’re conscious that you’ll never again make a story like that. It’s a piece of you going away. So for me, drawing is “rechargeable;” writing is not. That’s why I like writing and drawing contemporaneously. They are both difficult â€¦ and easy at the same time. Perhaps drawing is a little easier, once you’ve learned it. Besides that, your stories need to be approved by editors, and often you risk working for nothing. So, that’s why I can say that drawing as opposed to writing is a little bit easier. 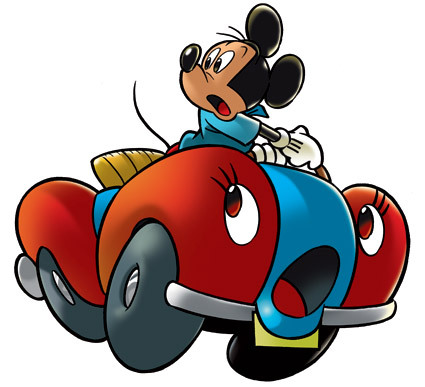 DCW: Since you started working for Disney you’ve written and/or drawn about 45 Mickey Mouse stories. Are you interested in exploring the world of ducks or other Disney characters in the future? Casty: I’ve just finished my first story featuring … Uncle Scrooge! It’s a story Ã la Carl Barks, with Scrooge hunting for a mysterious treasure. I’ve really enjoyed myself, and I hope to write more stories with ducks in the future. But Mickey remains my favorite, of course! DCW: Boom! 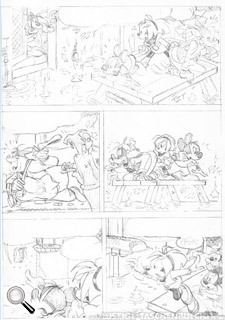 Studios here in the United States has selected your story “Mickey Mouse and the World to Come” for publication in the next Walt Disney’s Comics & Stories. If they decide to print another of your stories, which one should they pick? Which of your own stories is your favorite? Casty: I love all the stories I did with Giorgio Cavazzano and Massimo De Vita. These Masters really gave life to what I wrote. 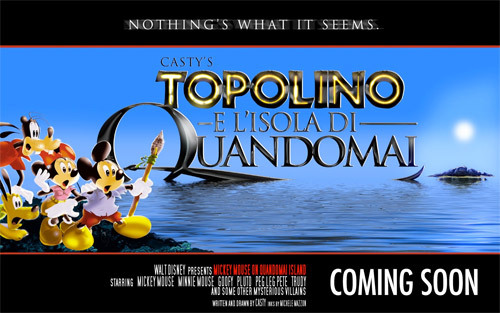 But if I could choose one story to be representative of my work, I’d pick “Topolino e l’isola di Quandomai” (“Mickey Mouse on When-Ever Island”). I love this story because it has mystery, twists, humor and an ecological theme. It was not easy to use all of these these elements in a single story. It will soon be published in Italy and I hope U.S. readers will have the chance to read it too, sooner or later. DCW: What are you working on now and what can we expect from you in the future? Any non-Disney projects you are working on? I’m currently writing and drawing another long story with Mickey and Eega Beeva, titled “Mickey Mouse and the World of Tutor.” It’s a sort of apocalyptic sci-fi thriller, and it should be published next spring. Next, I’d like to keep on writing (and drawing) a few stories with Eega. 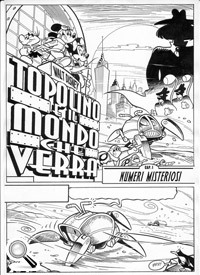 And I still have a dream: to produce a short series of stories, a trilogy, with the one Scarpa character I love the most: Atomino Bip Bip! Non-Disney projects? Well, I’m also running a graphic art studio, so at this moment I have no time to work on any other comic projects. But, I have some original characters in my drawer and I'm sure one day I’ll pick them up…. Casty: I’d love to say hello to all U.S. readers and I hope they’ll like the story as much as European readers did. 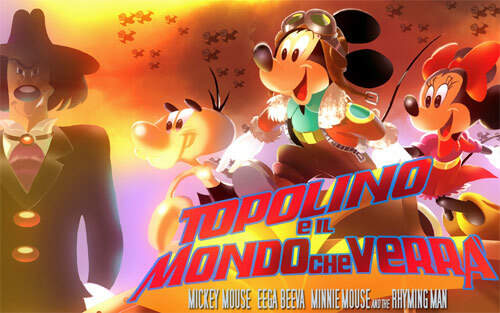 “Mickey Mouse and the World to Come” is made for those who love the traditional, adventurous Mickey. I hope it will be appreciated by young readers, too! That’s all, thanks to you for giving me the chance to introduce myself. For more information about Casty see this fan-made website about him. Casty’s “Mickey Mouse and the World to Come” will start in issue 703 of Walt Disney’s Comics & Stories which will be released on February 10th. The series is published by Boom! Studios and the issue can be pre-ordered for $2.39 here. 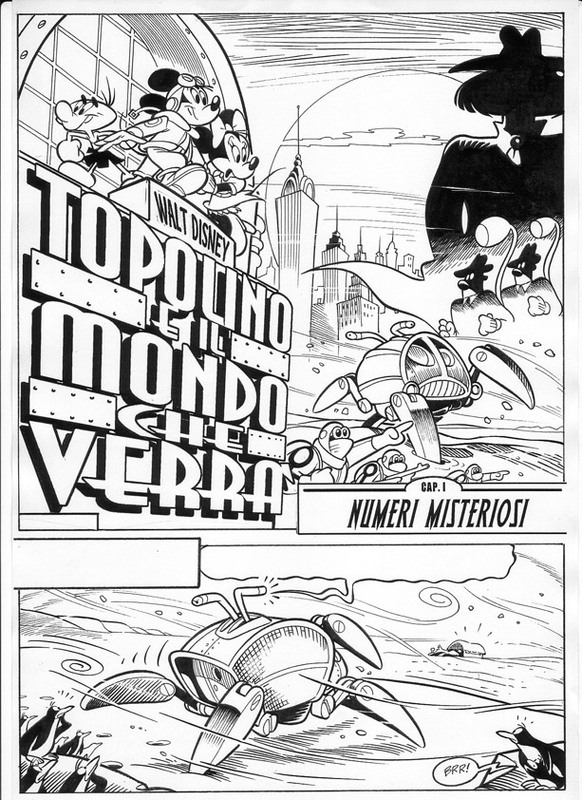 The story, originally titled Topolino e il mondo che verrÃ , first appeared in the Italian weekly Topolino magazine issues 2721 through 2724 in January 2008. This entry was posted on Tuesday, January 26th, 2010 at 6:39 pm	and is filed under Artists, Boom! Studios, Interviews, Italy. You can follow any responses to this entry through the RSS 2.0 feed. You can leave a response, or trackback from your own site. Great interview! Thanks for publishing it! I agree, a most interesting interview. Casty’s the one Mickey artist active today, whose stories have stood out among the rest and fascinated me long before I knew his name. As a Mickey Mouse lover and collector since my very early childood I really enjoyed this article. As a beginner journalist I found it a wonderful interview. It’s hard to keep the attention of readers with a piece so long! Good job! PARABÃ‰NS AOS ARTISTAS QUE TRABALHAM PARA A DISNEY EM TODO O MUNDO!